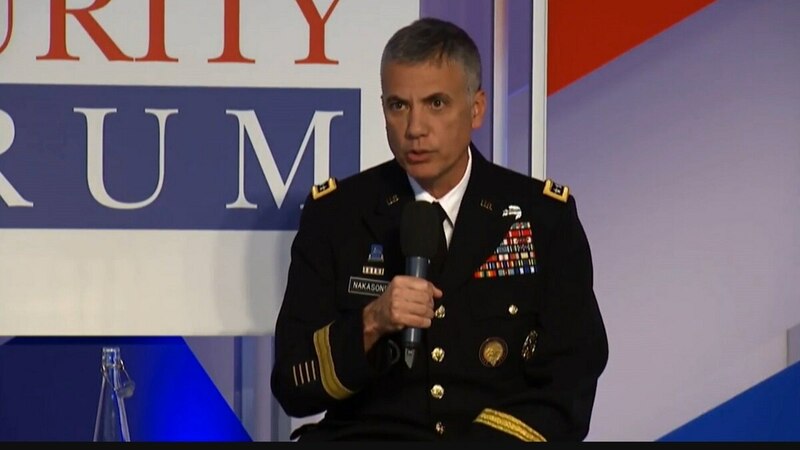 Gen. Paul Nakasone, shown in this video capture during an appearance at the Aspen Security Forum July 21, is advocating for a more expansive partnership between the government and the private sector amid an array of cyberthreats. The head of the National Security Agency and Cyber Command is advocating for a more expansive partnership between the government and the private sector amid an array of cyberthreats. Information from Cyber Command and the NSA will be used in a new National Risk Management Center that hopes to share cyberthreats between the government and the private sector, according to a department spokeswoman. ”Resiliency begins with a dialogue,” Nakasone said. The new center’s announcement comes after DHS said that Russia was continuing to attack America’s electric grid. Last week, Sen. Claire McCaskill D-Mo., said that Russian hackers tried unsuccessfully to infiltrate her office. On the same day that Nakasone spoke, Facebook said that it removed 32 accounts in an apparent influence campaign. Ninety percent of America’s critical infrastructure is in private hands, Nakasone said. Therefore, the Department of Defense is kicking off the new risk center with a “90 day sprint” to identify companies that are most essential to the U.S. way of life in an effort to protect them from foreign cyberattacks. “Not all risks are created equal,” Nakasone said of the initial effort.